When I was a little girl, I had the chance to live and travel to many parts of the world as the daughter of a Peace Corps director. However, I never took a trip “around” the world-until I made this quilt. Trip Around the World is the name for this quilt design which starts with a fabric square in the center and radiates outward with seemingly hundreds of other colorful squares that create one big square after another. I’ll admit, when I first saw the pattern for this quilt I was a little intimidated because I thought it contained far too many individual squares than I could possibly keep up with. The little 2-inch squares actually are not sewn together individually at all. It only looks that way. Since I completed this particular quilt a while ago without taking pictures of the process, I’m going to back-track the steps for you using leftover fabric from different projects. Six different fabrics were used for this quilt so I just rounded up half a dozen remnants for this tutorial. 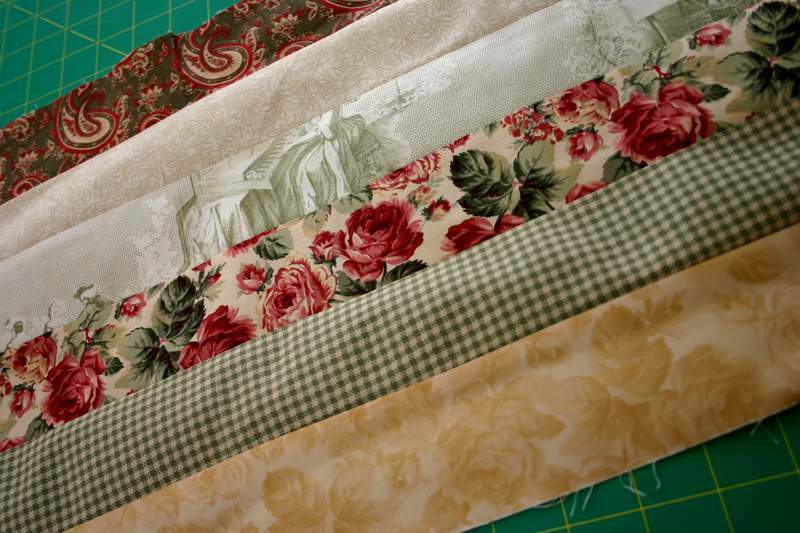 Start by cutting 2 1/2-inch fabric strips out of each fabric selection. Cut the strips the length of your fabric yardage. If you make this project you’ll be cutting strips much longer than the example in the photo below which is a scaled down version for purposes of this basic illustration. Sew the strips together using a 1/4-inch seam allowance. I use a special 1/4-inch foot which attaches to my sewing machine. It has a small black metal fabric guide to the right of the needle and the raw edge of the fabric rests right up against it as it’s being stitched. This is a great tool to help maintain a consistent 1/4-inch seam allowance. You can contact your sewing machine manufacturer or local sewing shoppe to find a 1/4-inch foot to fit your particular machine. After stitching all your strips together, you’ll end up with a very large piece as in the photo below. Iron this piece flat making sure you do not stretch or pull the fabric during the ironing process. Once the strips have been sewn together and ironed, cut across the width of the newly constructed piece to create new strips which are 2 1/2-inch in width. See-thru quilter’s rulers make this step a breeze. You’ll notice in the photo below that each new strip contains a 2 1/2-inch square from each of the six fabric selections. The strategic and staggered placement of these strips is what creates the Around the World design. Because of the 1/4-inch seam allowance on each side of the strips, your finished squares within the strips will end up measuring 2-square inches. Remember, your actual strips will be much longer than the ones in the demo photo below. When sewing these strips together make sure you line-up your square seams and pin in place before stitching. As you can see in the photo below, after staggering your strips per the pattern instructions and stitching them all together, you’re left with the appearance of tons of individual squares. I think this is a wonderful pattern that actually suggests it’s more complicated to construct than it really is. Of course, it’s no secret by now that I love a scalloped border on a quilt. 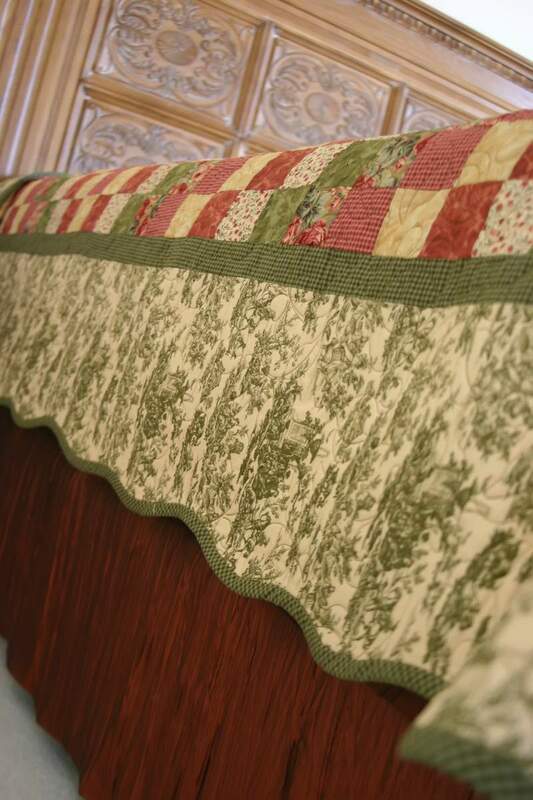 As always, I applied that technique to this project using the same green-checkered print for my binding that I used for the small border within the quilt. I think when you repeat fabric selections like the binding and a border, it really helps tie all the pieces together for a nice effect that looks consistant and well planned. I just love how this checkered print looks against the green toile. Speaking of toile, my favorite part of this quilt is definitely toile print. I’ve said here many times that I love just about all things toile. There’s just something about this style of fabric that always speaks to me regardless of the color or pictoral depicted in the print. To me, it’s such a classy fabric. I also think toile makes an especially beautiful backing for just about any quilt. It just gives it that vintage look that really helps a modern-day quilt look much older. Take a look at the contrast of the quilt backing with the other fabrics in the quilt top in the photo below. I love this combination of fabrics which comes from a line manufactured by Marcus Brothers called Vintage Gardens Collection. Here is another view of that scrumptious toile on the back of the finished project. I think using a fabric like this for the back makes the quilt virtually double-sided because the back is as pretty as the front. I loved this green toile fabric so much I ended up buying the entire bolt. Needless to say, I have several other projects using some of this same stash. I’ll share those projects later in an upcoming post. So next time you’re planning an excursion, why not consider this trip around the world? Just think, it’s fun-filled and colorful, and you’ll never need a passport. Congratulations on your recongnition of great craft work. I was so excited when I read it. I know you’re having a lot of fun. Also, I’m still working on getting the blog setup. Your photography is STUNNING! I feel like I’m standing over your shoulder reading along with you. You have an amazing eye for detail, not only with your crafts, but the way you make a one dimensional object, (photo) come alive and appear as if it’s in 3D. Love the blog. Oh my gosh, Lisa! That quilt is beautiful! I will have to bookmark this and try to make one too, when I find some spare time. Just wanted to say congrats on your feature in Romantic Homes! I recognized you right away and was thrilled to see you featured…you deserve the recognition for such a great and inspiring blog! What a fabulous post, Im a huge collector of old quilts adn yours are wonderful! Hi Lisa! I found you from Tara…oooh my gosh! What beauty you create. I have NO talent for sewing and really admire those who can AND do…Beautiful work! I really enjoyed my visit to your blog. xoxo ~ Joy J. LISA!!!! Hey congrats on your blog mention in Romantic Homes! SO deserved!!!!! I was so excited when I opened it up and saw you in there!! Wow! You are the Queen of making things. fabulous. Lovely quilt and perfect tutorial. Thanks for taking all of us on a free trip around the world! And to think we didn’t need to bring any luggage! Heehee. You’re amazing. Btw, interesting to learn about your father being a director of the Peace Corps. This is a beautiful quilt! And I love the toile backing idea. I feel like we’re sharing a brain lately as I’ve been short on blogging and long on quilting lately. Also you’ve really inspired me to make memory books for my family. It’s nice to peek in and say hello. Ciao! Now that’s clever! Beautiful quilt and I love the toile on the edge! What a beautiful quilt!!! Wonderful that you shared with us how you did it. You have a beautiful blog, Lisa. Thanks for stopping by my blog and saying hello. I enjoy your visits. Oh my! That quilt is gorgeous! I love the toile scalloped border. And I agree, the back is as pretty as the front. 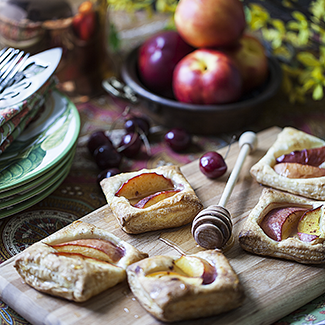 It remindes me of the french Whole Cloth quilts. One day I’ll find the patience to quilt. Lisa, this is a beautiful quilt! I love the colors you used and the backing is gorgeous. Your quilting directions are superb and I’m sure would be so easy to follow. Lisa, that is a beautiful quilt. The colors are gorgeous!! I too love toile. Oooo Lisa, you surely have the energy needed for a trip around the world. Such a beautiful quilt is the result! love this. i have the pattern and just havn’t done anything with it yet! Do you do your own quilting? hand .. or machine? You know I’ve seen these quilts and I”m always amazed at the work involved. But you’ve made it more logical. Great! Lisa, I admire your ability (and patience) with your tutorials almost as much as your obvious crafting talent. I’m gearing up to try some quilting but the instructions usually leave me more confused than ever. Not so with this tutorial! Thank you for making it look so do-able. Oh, and I love toile too – fabulous all round. The quilt is awesome Lisa! Your talent always amazes me! Everytime!! Wow, what a beauty!!! I can’t believe you made that! Incredible! wow lisa, that is absolutely beautiful. wish i had your talent. This is gorgeous, Lisa! Pink, green and white is one of my all time favorite color combos. I am using that strip piecing technique for a quilt I am working on. It is so fun to just do the long strips. That is the one thing that always discouraged me with quilting–piecing all those little squares. I would never have the patience for that! Oh wow! I’m so impressed. So, thats how you get all your squares. You sew strips and then cut them! What a clever lady! Thanks for the tutorial….and what a gorgeous trip around the world~!! thanks for stopping by to see my blog. Your quilt is beautiful and your studio is so nice and big …aren’t you lucky to have such a nice space to work in…everything is so organized! My sister made my daughter a baby quilt using this pattern. I treasure it. It is thread bare and very soft these days…just the way I like it. A lot of love went in to making the quilt and a lot of love went in to making it soft. The scalloped edge on your quilt is to die for. Lovely! What a beautiful quilt! I have a longarm machine and I have quilted several “Trip Around The World” quilts for my customers, but I have never made one. Now I just have to find time and do it. Thank you so much for sharing. I love your blog. You do a beautiful job! What a stunning quilt! Thanks so much for the tutorial. Hi Lisa!! Yeah, I say WOW everytime I visit! I adore quilts. We are going to use them in abundance at the beach house, even to make slipcovers. You do such beautiful work, I wish I could sew like you! (oh, ok, sewing at all would be a first step). I am so glad you popped by today, I had just been thinking it was time for a little visit over here! You never make me stop saying WOW! Amazing job Lisa! I discovered your blog while blog-hopping and had to pause long enough to say, “What a gorgeous quilt!” I love your fabric choices and that toile is to die for. Thank you so much for sharing the process. I am so bookmarking your blog! Another gorgeous project! I love it. My mother made me a beautiful quilt with a toile background in blue, she also adores that fabric. How do you do the scalloped border? Do you cut it like that and then bind it? I’ve never seen it before, but it adds something so lovely to a quilt. That’s a beautiful quilt. You do such a wonderful job. I have been a lurker but I love your work and your nice photos of the process. Thank so much for the inspiration. another toile lover! i am enjoying your step by step process. thanks! How pretty! I enjoyed seeing how it went together also. Lisa, you never cease to amaze me with your talents. And I am *so* going to buy one of those presser feet for my machine! P.S. I’m doing a giveaway on my blog, so check it out! I have done just that! Made a Trip Around The World quilt. I made it in the early 1990’s, and my eldest daughter now has it. I made it in bright, cheerful colors of red, blue, yellow and and green. Yours is lovely with the toile. Wish I’d thought of that backing when I was making quilts! I usually just used the muslin of old. Beautiful Quilt. I love your colour choices and I definitely share your love of toile. I’m always looking for projects that can take advantage of these beautiful prints. I really like your quilt. “Trip Around the World” – a traditional pattern popular in early America in the Amish and Mennonite communities – was the second quilt that I ever made many years ago. It is a great pattern for beginners – it’s easy and the outcome is so satisfying that it builds confidence. Wow, how lucky you were to have been able to travel like that!! I once began a quilt… it ended up being a small but nice wall hanging. I tried quilting once…lets just say that it did not work out.. Please stop by my blog and read about a creative contest I am holding with a great prize. If you are not interested – please forward it onto as many people as you can. Thank you! GORGEOUS! I want to make quilts like you when I grow up. Did you machine quilt it yourself? I’m just down to handsewing the binding on a quilt I made my daughter. It has TONS of mistakes, but I learned a lot, and I had fun overall. I’ve already started on my next one. I posted the second inspiration piece. It just so happens to be a quilt. I hope you can join us. I love to see your beautiful projects. Talk to ya soon! That is gorgeous and a very unique way to make it look like everything is individual.